Titan Comics: Doctor Who THE TWELFTH DOCTOR #2.5 Review | Warped Factor - Words in the Key of Geek. Tony opens his latest comic-book. Have you ever wondered if each of the incarnations of the Doctor have a private battle going on with all their other selves? A kind of ‘anything you can do, I can do better’ contest? 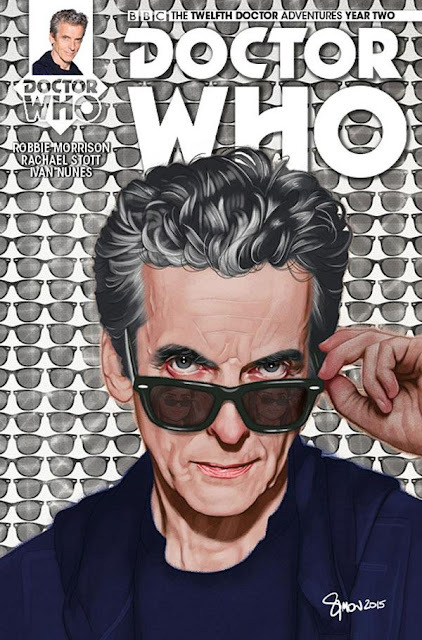 This issue of the Twelfth Doctor comic-book, written by Robbie Morrison and drawn by Rachael Stott, reads almost like the Twelfth Doctor looking back at the Ninth Doctor’s most recent adventure and singing ‘Anything you can do, I can do meta.’ Where in Doctormania, the Ninth Doctor lands on a planet where ‘Doctor Who?’ is a popular global TV phenomenon and there’s another version of him wandering about the place being pretty marvellous and saving the world, in this comic-book, the Doctor begins by literally breaking the fourth wall, talking to we readers from inside the panels of a comic-book. There’s an additional similarity in that where the Ninth Doctor’s problems are actually down to a returning TV enemy from his first (and only) series, so the Twelfth Doctor is forced into battle with one of the more successful enemies that saw the light of day in his first series. While there are similarities between this story and that original, Morrison is nothing if not ingenious in finding new ways to use what feel like familiar enemies (a point he proved conclusively with his Weeping Angels of Mons storyline for the Tenth Doctor, which remains one of that Doctor’s high water marks in the comic-book world). Here he takes us into the world of this enemy, which in itself is particularly interesting from a philosophical standpoint (seriously – scholarly books have been written about worlds like this), while allowing Clara to grab the hand of a companion and essentially ‘be’ the Doctor for a bit, running away, commanding the Tardis and doing clever stuff (albeit on instruction), while the Doctor and his single-issue companion make every geek in the world feel pretty darned good about themselves and their comic-book addictions, using the concept of the collective unconscious to deliver that feelgood factor and as it happens, to defeat the villains of the piece – there’s some solid Whoing in terms of the moral here, with the power of fandom connecting people irrespective of time, space, geography, wealth or social class, and the whole world being better for that cauldron of commitment when it’s put to beneficial, positive use. Oh yeah – high—concept stuff this, but nevertheless, Morrison paces the issue so there’s plenty of running, peril and escalating stakes, so it’s not just a lecture on how cool we all are but an actually satisfying Doctor Who story in its own one-shot right. Let’s talk really rather a lot of Stott. Rachael Stott is an artist who has already proven what she can do – her work on the previous story-arc, Clara Oswald and The School of Death, delivered richness, precision, intimacy and grand scope, while using fairly complex artistic techniques to root the story in a world which behaved like our own in terms of light, reflection, shading and the like. She also showed she had a solid handle on the leads, that let the storytelling resonate with the vibe of the on-screen version of Doctor Who with which we’re all familiar. Here she gets not only to play with traditional comic-book form but to occasionally smash it to bits and dance on its ashes. The precision of her style still anchors the story very much in the real world we know, (though between them, she and Morrison may push a visual gag a little far, with unspeakable evil emanating from a ‘Prohibited Sphere’ store, and comic-books including ‘Spidery-Guy,’ ‘Steel Man’ and, as it happens, ‘Time Surgeon’) but here, Stott gets to play with the surreal and the abstract too, entering a world that has a vibe familiar from The Bells of St John – individuals trapped and alone, uncertain where they are in an isolated dimension. It also gives her the chance to do some glorious self-referencing – and you’ll appreciate the lengths she goes to in this regard when you see them. So – big thumbs ups all over the multiverse for Stott’s combination of structure and invention, and delivering another story that’s anchored well enough in the ordinary world to allow the invention to hit you good and hard. There’s also a happy welcome to Marcio Menys on colourist duties, here giving good bright happy daytime, to allow the alternative to be darker and moodier by comparison. 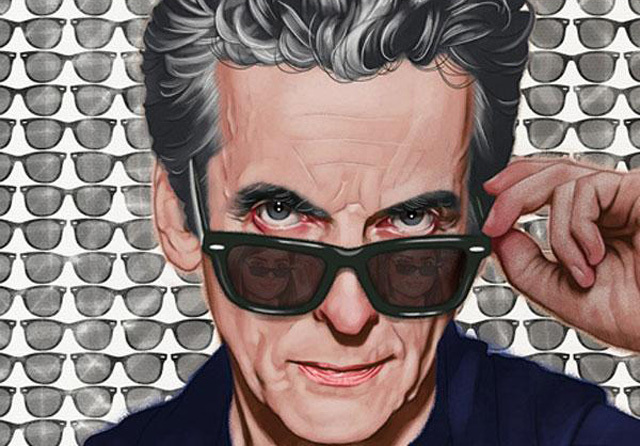 Between the three of them, Morrison, Stott and Menys deliver a solid double-page poster-feel to the crisis-point, with Capaldi’s Doctor in barnstorming visual form, summing up the power of geekdom and issuing a command that seems to have been on the tip of his tongue since he regenerated. 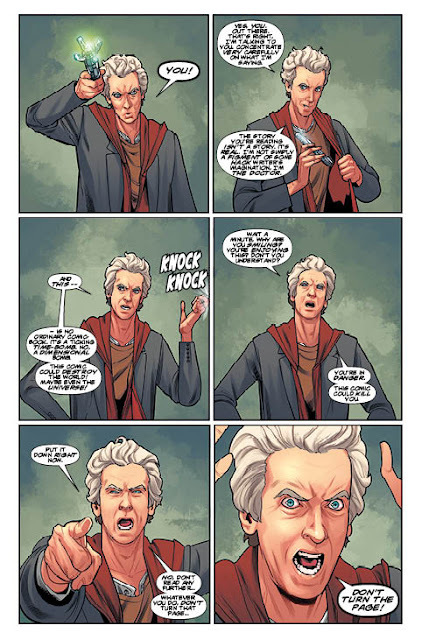 They’re not perhaps as fundamentally eloquent as his ‘War’ speech from The Zygon Inversion, but you couldn’t get more classically Twelfth Doctor than this pair of pages. All in all, this is a cracking one-shot that brings back a TV enemy for a second adventure that, much like Clara Oswald and the School of Death, could be very much delivered on TV. While perhaps the likes of Fear Her have made fans wary of the trope of ‘and then it came to life!’ this enemy, sensibly handled, as it was on-screen and as it is here too, brings a new shudder to the spine in terms of the ideas it embodied – here, the idea of being trapped in a comic-book world while something else entirely escapes into our world. More from this enemy on the strength of this showing? Oh hell yes. More from Morrison, Stott and Menys on the strength of this showing? Of double hell yes with chocolate sprinkles.